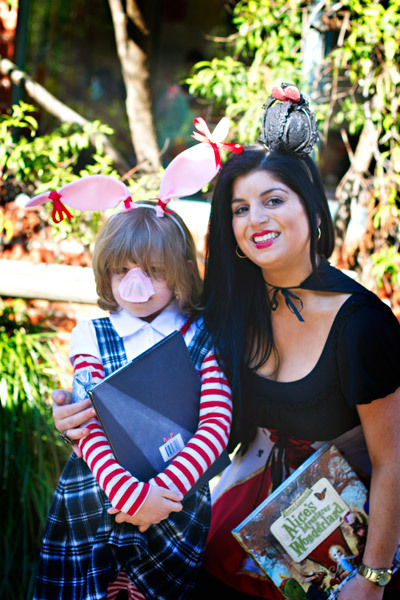 This week was book week and today the kids had a dress-up parade at school. With the amount of tv show and movie characters there, I'm not sure if all parents read the fine print that they should be from a book that preceded any tv show or movie, LOL, but it was still fun. I love seeing kids dressing up. We had a happy Peter Pan, eventually, after much negotiation about all the types of pirate he could dress up as. Apparently they all needed me to make him a new costume, instead of using any of the half dozen pirate outfits he already has. In the end it was 7pm last night when I just said let's look through the costume cupboard and see what we can find. I am grateful to another mum of a boy in Ash's class, as she was dressing her son up as Captain Hook. 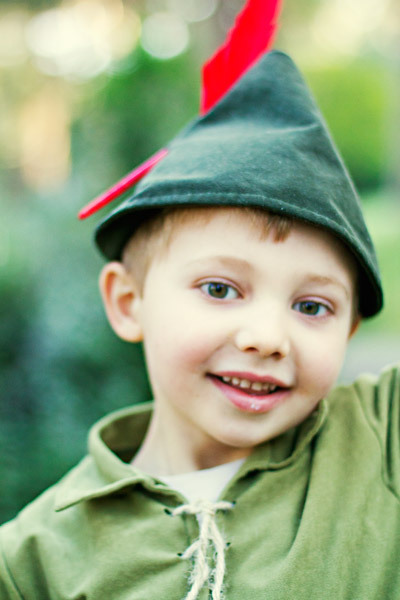 This made Ash happy to go as Peter Pan, in a costume we've already had for a couple of years, so that was easy! 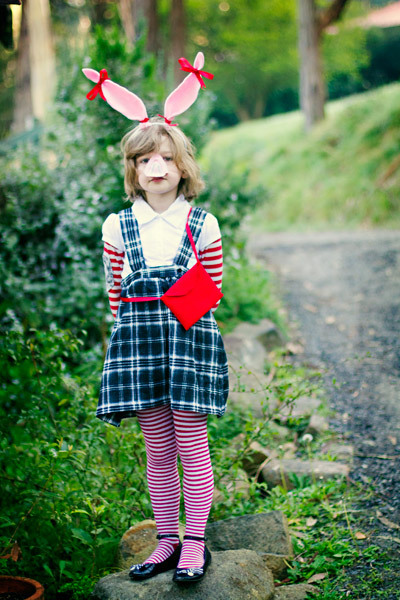 She already had stripy red and white tights and black shoes, and borrowed Ash's stripy red and white long sleeved top. I bought her the white polo top for $7.50 from Best & Less, and it will be a handy addition to her summer wardrobe anyway. The pinafore I made yesterday afternoon from a flannel shirt I had bought from Kmart - size 4XL, plenty of fabric - for $5. Red felt and ribbon, some double sided tape and a few quick stitches made a quick bag. The same ribbons were added to pink felt ears. I handstitched the pink felt nose with grey embroidery thread. Sienna, as much as the Olivia outfit was her idea and she was very keen until this morning, wasn't very happy. 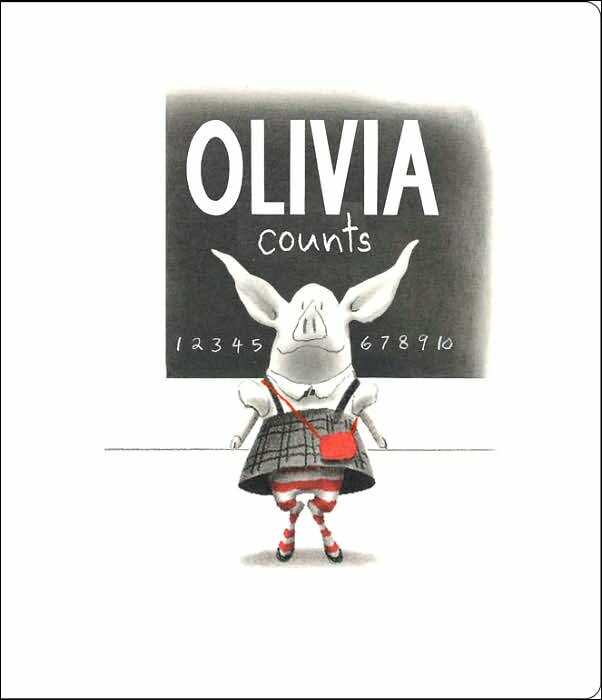 Once she saw herself all dressed up and it came time to think about actually going to school, she became quite anxious and upset, convinced that she would be laughed at because she was dressed up as a pig. But we got there, with constant cajoling, and she sat down in her classroom as long as I agreed to stay for the parade. Eventually (after the parade), enough people had told her she looked cute, and she had settled in to the idea, that I could happily leave her and head back home with Cedar. Here's a quick photo of Sienna and her teacher Mrs Arvo. Yes, she's fairly young, both my kids teachers are younger than me. And I'm 30, so they are reasonably young for teachers. They are both really good teachers, though. Irene (a.k.a. Mrs Arvo) has a pretty no-nonsense approach with Sienna which *usually* gets her onside. Occasionally it gets her upset, LOL, but mostly it works. 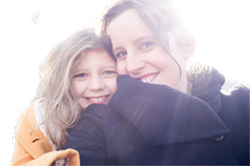 And when I've had meetings with her from time to time, she's been really keen to take on new ideas of how to handle Sienna, and we've agreed on a negotiation of homework and some things like that to be realistic about some of the Aspergers-related issues Sienna has. Sienna took a term to get used to Mrs Arvo - the first change of both teacher and classroom since she'd started school 2 years earlier - and now she really likes her. So both the kids are in pretty good hands. They are in a small school, so everyone knows who they are, which can be really handy. For instance, this afternoon it took 15 minutes to find Sienna at the end of the day, with her school teacher, a couple of handy students, myself, Ash and the school-crossing-supervisor all looking for her, eventually the principal tracked her down and brought her out to me. This happens every few weeks for one reason or another, and knowing that everyone is familiar with all my kids makes it a lot less stress than the same situation would be in a larger school. Much happier now, yay for small schools and young teachers! The kids' costumes are terrific, Danielle! Thanks for sharing the story about Sienna's teacher and the fact that they attend a smaller school. Sounds like a good idea. So glad to hear the teacher listens to you.